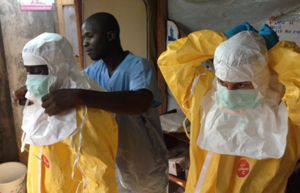 The Ebola epidemic brings to the forefront the imperative to reinforce healthcare and laboratory systems, which has resulted in national governments taking critical steps to close the vulnerabilities in these systems. In light of the challenges uncovered in the outbreak response, how can governments effectively synthesise such information to establish resilient healthcare and laboratory systems accessible for Africa’s 1 billion citizens? One answer is by the creation of a new framework for operationalising functional and high-quality laboratory networks, aimed at meeting the needs of both public health and individual patients to address the GHSA. As such, the African Society for Laboratory Medicine (ASLM), with support from local and international partners, tabled this new framework at a consensus meeting in Freetown, Sierra Leone, 15-16 October 2015, which aimed to deliver much-needed practical guidance to Ministries of Health building upon the mandates of the Maputo Declaration of 2008. The strengthening of healthcare systems stems from country leadership and is guided by seminal agreements such as the Maputo Declaration  and the International Health Regulations (IHR) set forth in 2005 . 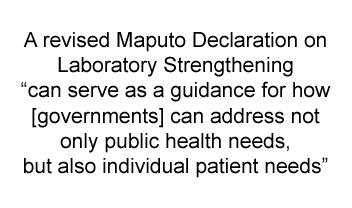 Specifically, signatories of the Maputo Declaration called for the development of robust laboratory systems for the detection of globally high burden diseases. The Declaration set the stage for laboratory strengthening and brought attention to the critical role diagnostic services play in controlling outbreaks. Now, several years later, with first-hand experience of the devastation of inadequate healthcare systems, the GHSA has committed to work collaboratively to secure the safety of populations from infectious diseases. The laboratory system is a cornerstone of the GHSA, upon which many activities depend. Therefore, the development of a revised Maputo Guidance on Laboratory Strengthening is a relevant step for tackling the challenges of securing nations from biological threats. A revised Declaration “can serve as a guidance for how [governments] can address not only public health needs, but also individual patient needs,” says Michele Best, Laboratory Director, Dimensions Healthcare System. A new framework, Maputo 2.0, if grounded in critical lessons taken from those who were directly involved in recent outbreak responses, will be highly relevant for future use. Key areas that will be addressed are needs surrounding laboratory infrastructure, guidance on human resources, testing menus, tiered laboratory systems, public health and individual patient care needs. Importantly, the new framework shall be inclusive of other disciplines, specifically the clinical piece, as it relates to laboratories. By integrating strategic and implementation plans, a revised Maputo would pave the way for national policies and strategic and operational plans to be updated. New effective guidance to address the GHSA can forge a clear path of action for leaders, healthcare workers and patients themselves to prevent, detect and respond to public health emergencies of international concern.